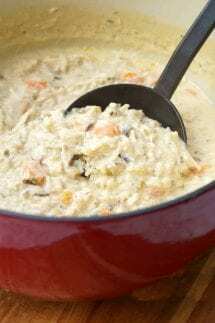 This Quick and Easy Chicken and Wild Rice Soup is perfect for dreary winter days. Creamy and comforting and made it under 30 minutes, your family will love this easy soup recipe! In a large pot, add the two tbsp. of canola oil and turn heat to medium high. Add carrots, onions, and celery. Season with 1/2 tsp salt. Stir and cook over medium heat for 5-6 minutes, or until veggies are tender. Add rice to pot and half the seasoning packet. Add 1/2 the pepper and the marjoram. Stir well. Add evaporated milk and 4 cups of the chicken broth. Turn heat to high and bring to a boil. Once boiling, cover the pot and reduce to medium heat. Let simmer, covered, for 15-20 minutes, or until rice is tender. Stir well to prevent rice sticking to the bottom of the pan. Once rice is tender, add the cup of milk and the cooked chicken. Stir well. Add additional chicken broth if too thick and add additional salt and pepper if needed. Serve or continue to let simmer over low until ready to serve. Soup will thicken the longer you let simmer.